“sending the whistleblower back to face certain danger is an abdication of Australia’s commitment to human rights”. 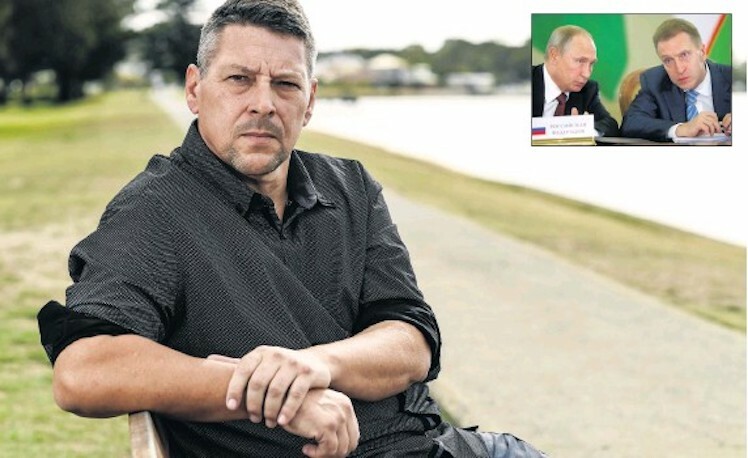 Nick Stride, British glazier who once worked building a greenhouse for former Russian deputy prime minister and current head of Russia’s largest bank, Igor Shuvalov, is facing deportation from Australia along with his wife, Ludmila Kovaleva and their children. Bill Browder told us that Nick Stride is a “key whistleblower who exposed massive corruption” by a key Russian official. The documents he leaked helped expose corruption and nepotism within the Russian oligarchy. Now he and Ludmila are fearful that the oligarch may be out to harm them. According to Bill Browder, the whistleblower has good reason to fear for his life. 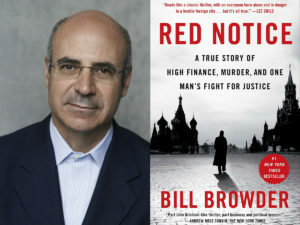 Browder’s assessment is borne out by the ugly scenes at Moscow airport on Friday (18 January) when another whistleblower, the young Russian woman, Anastasia Vashukevich, was roughly arrested and taken away by secret service officers. Vashukevich had claimed in a since-deleted YouTube video that she had evidence of oligarch and Putin associate, Oleg Deripaska and members of the Trump campaign team colluding over the 2016 US election. In February 2018, Vashukevich was arrested in Thailand on prostitution charges; a few days ago she was deported back to Russia and immediately taken into custody. Browder himself also has reason to fear the Russian authorities. The UK-based investor and business analyst has been falsely accused of involvement in the November 2009 death of Russian lawyer, Sergei Magnitsky who died in a Russian jail after being beaten and tortured. At their July 2018 Helsinki summit, Trump seemed to agree with Vladimir Putin’s request that Browder be extradited to Russia to face questioning over the spurious allegations. Nick Stride’s problems began in 2006 when he was contracted to work on the construction of a lavish “wintergarden” greenhouse-style pavilion in the grounds of Shuvalov’s palatial 7.5 hectare estate in the Odinstovo region on the southeast outskirts of Moscow where his neighbours are fellow oligarchs. 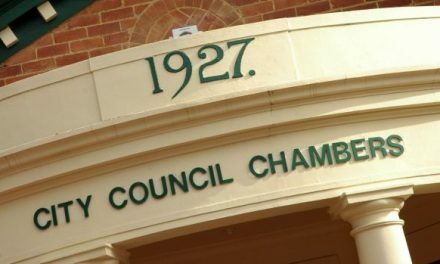 The structure was to be built in glass and stainless steel and was valued at over $AUD 2.7 million at the time. In 2010, Nick Stride and his family fled Russia fearing that Shuvalov or his associates would seek to extract revenge because of what he knew about the politician’s affairs. After coming to think that he was not safe in the United Kingdom, Mr Stride brought his family to Australia. Mr Stride has already alleged that he and his family were threatened with “severe consequences” because of what he knew about Igor Shuvalov’s tax affairs, money laundering and business deals. There has been very little coverage of Nick Stride’s appeal for asylum in Australia, which has dragged on now since 2012. 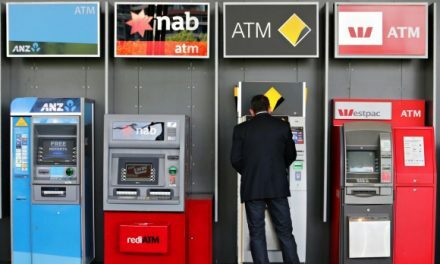 An article by Tim Clarke appeared in The West Australian in March 2018, but there has been nothing before or since. This week, the world was alerted to Mr Stride’s case by a tweet from prominent American journalist, Michael Weiss who wrote a 2014 expose on Igor Shuvalov’s alleged corruption based on documents and testimony from Nick. Michael Weiss is a long-term critic of the Russian regime and is editor-in-chief of The Interpreter an English-language clearing house for anti-corruption stories out of the former Soviet Union. Over the past few years, the work of Weiss and other investigative journalists shows that former deputy PM Shuvalov is one of Russia’s richest oligarchs with close ties to Vladimir Putin and the Kremlin power elite. Igor Shuvalov has had a long association with the Russian oligarchy. He was so well trusted that in the mid 1990s he became one of the top Kremlin officials dealing with the privatisation of Russian state assets. In the early 2000s, he became influential as a government appointee to oversee the financial and insurance sectors of the Russian economy. In these roles, he gained an international reputation as a representative of the Russian government at G8 and other global forums. In 2008, Shuvalov became one of the youngest deputy prime ministers at the age of 41 and has held that role under both Dimitry Medvedev and Vladimir Putin. At the same time, he has operated in the role of economic “fixer” for Putin and was heavily involved in Russia’s staging of the 2018 soccer World Cup. He remains at the heart of the Kremlin’s economic decision-making structures. Shuvalov resigned as deputy prime minister in May 2018 but he is now head of the influential Russian state-controlled bank VEB Bank which has been subject to US financial sanctions since 2014. At the VEB, Shuvalov is tasked with helping the bank recover from the impact of sanctions imposed on it under the US Magnitsky Act, named after a Russian lawyer, Sergei Magnitsky, whom many believe was murdered in 2009 on instructions from the Kremlin. However, as you might expect, Shuvalov’s stellar political and commercial career has also attracted scrutiny; most of it unwelcome. According to Russian media reports, Shuvalov is one of the richest men in the Kremlin hierarchy. His annual income in 2012 was listed as 222 million roubles, or about $AUD 9.8 million. Like many oligarchs, the actual sources of Shuvalov’s wealth are murky and hidden in trusts, offshore accounts and under the names of his wife and family members. In 2016, Russian anti-corruption campaigner, Alexei Navalny, who is regularly jailed by the Putin regime, exposed Shuvalov’s purchase of a Moscow apartment worth an estimated $AUD13.8 million. In 2011, Alexie Navalny wrote extensively about Shuvalov’s corrupt dealings and his links to other senior Kremlin officials and oligarchs with suspected criminal links going back to at least 2004. Navalny’s blog contains financial statements and bank records confirming Shuvalov’s involvement in underhanded deals worth tens of millions of dollars. 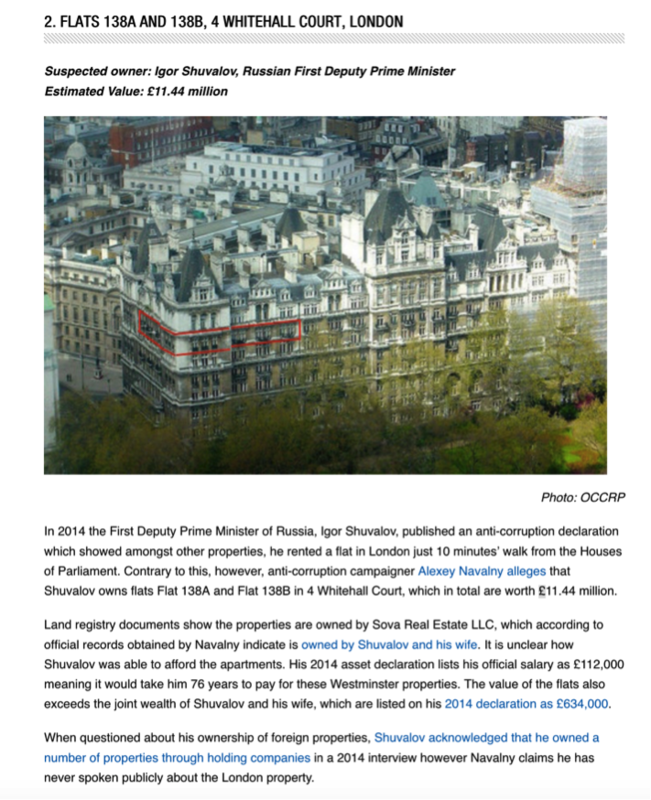 Since his financial affairs received attention from Sergei Navalny, Shuvalov’s extensive property portfolio has also attracted the attention of the anti-corruption watchdog, Transparency International UK which in January 2018 documented the oligarch’s ownership of two apartments in central London worth an estimated £11.4 million (about $AUD 20.5 million). Shuvalov has always claimed that his business activities are above board. In a 2012 statement to The Wall Street Journal, the then deputy prime minister of Russia declared: “I’ve unswervingly followed the rules and principles of conflict of interest. For a lawyer, that’s sacred.” In 2013, Shuvalov told the Russian news outlet Novaya Gazeta that all his assets from around the world had been transferred to Russia under a recent legal change aimed at cleaning up corruption among the Kremlin-linked oligarchs. “We transferred all our assets to a Russian legal entity. Fully fulfilled the requirements of the law and those foreign companies, about which they wrote and talked a lot, were put under the liquidation procedure,” said the first deputy prime minister. (Translated using Google). The Novoya Gazeta also reported the value of the Shuvalov family fortune as 448 million roubles, close to $AUD9.3 million. This does not seem like anywhere near enough for him to lavish millions on flying his family Corgis to dog shows around the world, or to build a stylish glass and steel garden pavilion at is luxurious dacha. In June 2018, it was reported by journalists at Forbes Russia that Shuvalov had just purchased a Gulfstream G650 jet for an estimated $AUD97 million. According to the reports ownership of the private jet is held by Shuvalov’s son and registered to a company in Bermuda. The Shuvalov family also rates a mention in the famous Paradise Papers which exposed links between some of the richest people in the world and offshore banks that turn a blind eye to corrupt deals and are infamous for enabling money laundering and the hiding of assets. 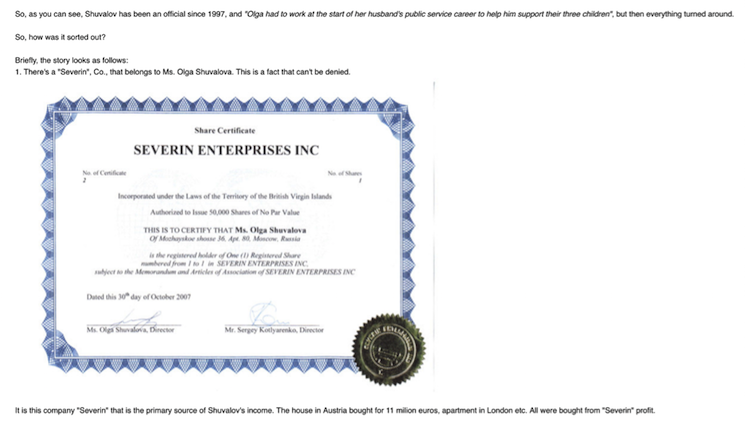 According to the Paradise Papers, Olga Shuvalova (Igor’s wife) is most likely the ultimate beneficiary of the company Altitude X3 Ltd which owns the Gulfstream jet purchased just last year, and had also owned the Shuvalov’s previous luxury jet a Bombardier DB-700. The Organised Crime and Corruption Reporting Project (OCCRP) also lists Shuvalov’s close ties to other oligarchs with equally shady reputations. According to a story published in December 2018, by Finance Uncovered’s Margot Gibbs, Igor Shuvalov also owns a villa in Dubai worth about $AUD11 million. Despite almost constant denials of any wrong-doing, the interlocking interests of state officials like Shuvalov and other oligarchs who’ve effectively been in power now for nearly 20 years, cross between official business and personal enrichment. The extravagant wealth of individuals like Igor Shuvalov cannot be easily explained. For example, where did a long-time government official who has held various posts since the mid 2000s find more than $AUD25 million to invest in the Russian oil giant Gazprom in 2004? According to The Wall Street Journal, within four years, the Shuvalov family cashed out its Gazprom shares for an estimated $AUD110 million. However, in 2012 the Russian Legal Information Agency (RAPSI), which is Kremlin-friendly, gave Shuvalov a clearance declaring “nothing to see here” and blamed a disgruntled lawyer for false claims about Shuvalov’s offshore assets. As reported above, the Shuvalov family has never been far from the action in terms of the Russian oligarchy. While Shuvalov continues to deny any corrupt dealings and to claim that his offshore holdings are a legitimate way to structure his properties for “inheritance” purposes, his methods and the lengths gone to in order to disguise his fortune and its origins are all classic indicators of corrupt behaviour. The actions of Igor Shuvalov fit the pattern exposed by the Paradise Papers and other anti-corruption investigations that have angered Putin and his cronies. Perhaps Nick Stride and Ludmila Kovaleva are right to be worried about their safety and even their lives. The bodies of the oligarch’s enemies and critics can be found in graveyards all over the world. 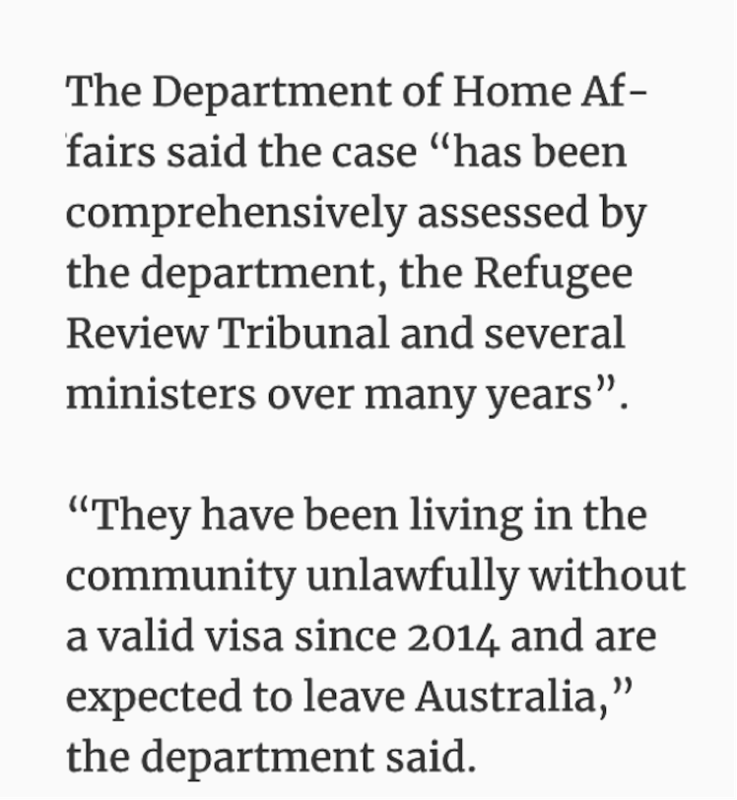 Well, we know that Home Affairs has previously commented. This is what the department told The West Australian in March last year. The ABC is now reporting that Nick Stride and his son Michael have left Australia to avoid deportation and are now somewhere in Southeast Asia. According to daughter Anya, her parents have separated due to the emotional strain of exile. This story will be updated as more information becomes available. Dr Martin Hirst is a veteran journalist, writer and independent scholar. In a media career spanning 40 years, Martin has written millions of words. His most recent book, Navigating Social Journalism, was published by Routledge, New York, in October 2018. NextBrookfield bid for Heathscope: a tax haven special?